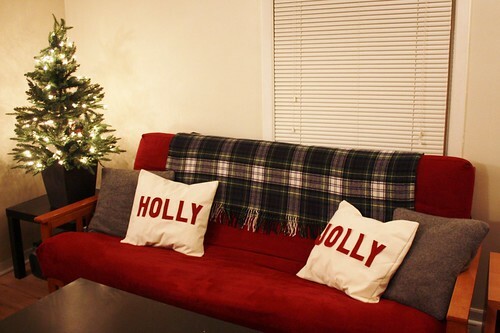 Inspired by all the fun Christmas pillow ideas on Pinterest, I decided to make a couple of new canvas pillow covers for our living room couch for the holidays. We haven’t decorated the tree yet (this weekend! ), but I tested out our new pillow covers with some grey faux fur pillows and a tartan wool throw and it’s already starting to look festive in there. I was able to find the perfect shade of raspberry red felt to match the couch cover. The stiffer cotton canvas gives the covers some structure and makes them easy to clean. The letters themselves were inspired by that famous Burl Ives tune, “Have a Holly Jolly Christmas”. I couldn’t help but play that a few times while I was making them. 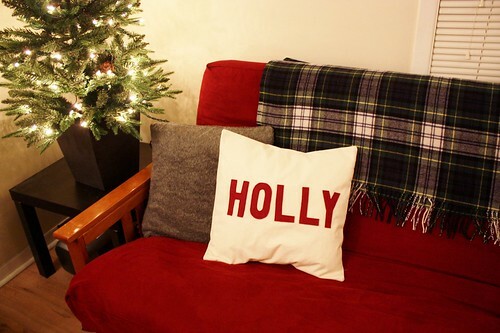 Making your own, using whatever holiday phrase you like, is a fun and easy way to add some festive pillows into your decor. I made both these pillow covers for less than $7! To make the felt letters sturdy and easy to sew, you’ll need to iron some fusible backing onto the felt. Cut a piece of the backing to fit your piece of felt, and place underneath the felt, with the glue dot side facing the felt. 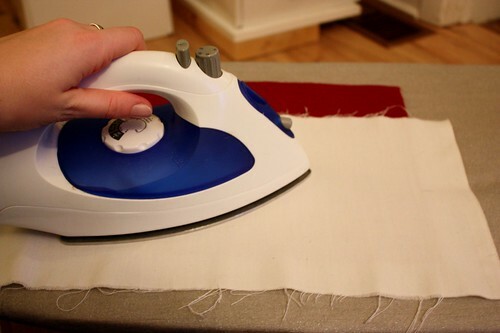 Felt can melt from the direct heat of an iron, so protect it by placing a piece of scrap fabric over top of the felt as you iron it. 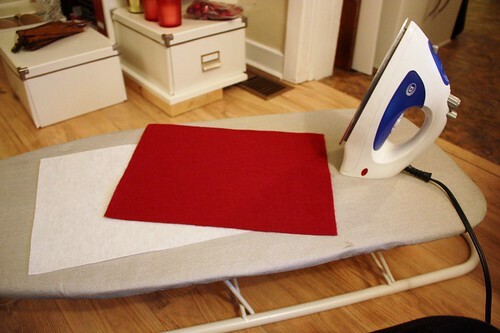 It may take a while for the adhesive of the fusible backing to adhere to the felt, so continue to move around the iron, to prevent burning in one spot. Cut out your letters on card stock. 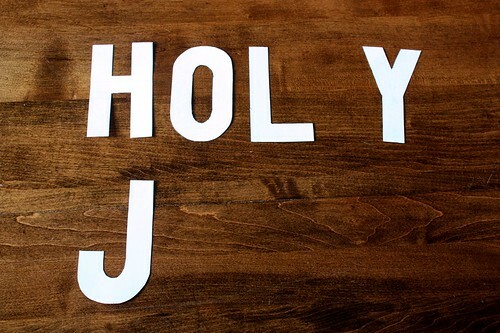 To make “HOLLY” and “JOLLY”, several of the letters are duplicated, so I only needed to cut 5 letters. I drew these ones by hand, using a ruler, but you could also print your letters directly onto the card stock, or use a Silhouette cutter if you have one. Flip the fused felt over, so that the fusible backing is facing up. 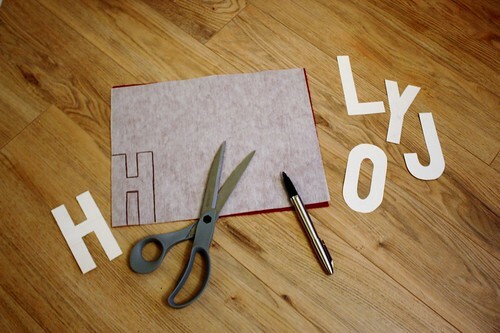 Trace the letters backwards (so that they will be correct when flipped), and cut with sharp scissors. Repeat as many letters as you need to have your full words. 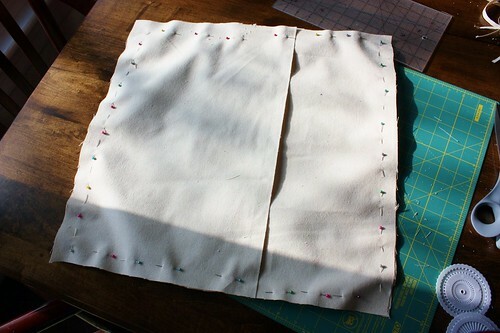 To make the canvas pillow cover, I used my Simple Cushion Cover Tutorial. It was so easy to whip these up, that I realized I should do this more often! I pinned and sewed the letters onto the canvas after I’d made the cover, and that was a little difficult. I would suggest applying them to the front of the pillow cover before you sew the cover together. It just requires making sure that it is centered correctly, but it is worth it to save you the hassle of trying to pin the letters on later. I love the way these turned out and they were such a simple and inexpensive craft. Now all we need to do is decorate the rest of the living room and finish the tree! So fun! 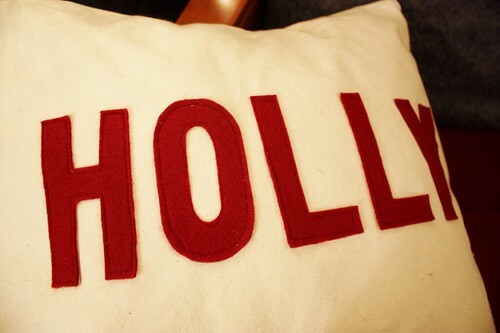 I made one earlier this week that says “Joy”, but now I’m thinking my couch could do with a Holly and a Jolly pillow! 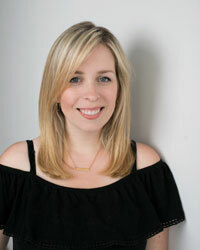 company lets them applying to the fund by filling up the borrowed funds application. Ahaa, its good dialogue on the topic of this paragraph at this place at this blog, I have read all that, so now me also commenting at this place. it to use! Among the best about jailbreak will be to start your iPhone. You will watch the screen there to the left side. by song, artist, album or genre. Firstly, we must find howto set the AssistiveTouch. Yes! Finally something about isogenics. is redsnow? It is possible to take a look at different jailbreak application instructions on BestJailbreakSoftware.